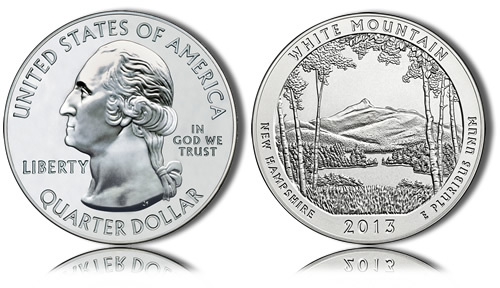 The 2013 White Mountain Silver Bullion Coins was released by the United States Mint on May 13, 2013. It marked the first 2013-dated release of the US Mint’s America the Beautiful Silver Bullion Coin® Program and honors White Mountain National Forest found in the state of New Hampshire. Each of these silver bullion coins is struck from five ounces of .999 fine silver and feature a diameter of three inches. These silver bullion coins are based on another series also from the US Mint – the America the Beautiful Quarters® Program. As such, both the obverse and reverse of these five ounce silver coins wcontain the same designs as found on the circulating quarters. This includes an obverse showcasing a portrait of George Washington and a reverse emblematic of the selected site of national interest – in the case of this coin, White Mountain National Forest. As a bullion strike from the US Mint, these coins are struck for investors and sold through the Mint’s network of authorized purchasers. This network resells the bullion coins to the public for a small premium above the current spot price of the five ounces of silver contained within each one. That price based on the coin’s content is directly related to a value associated with these strikes – the coin’s intrinsic melt value. Put another way, these coins will always at least be worth approximately the same amount as what five ounces of silver is trading for on the open market. That is the basic philosophy behind the Mint’s bullion coin programs which are designed to allow investors an opportunity to obtain small amounts of precious metals to add to their investment portfolios at as close to market prices as possible. Another value associated with these silver bullion coins would be their face value. Unfortunately, however, as these coins are based on the quarter dollars, that is also their face value – twenty-five cents. Relatively insignificant in comparison the coin’s other values. Finally, these coins may also be of interest to collectors, especially if their is a perceived rarity issue with the strikes. This value is known as a coin’s numismatic value and may increase if the coin in question features relatively few blemishes and can be graded by a third-party grading service in as close to Mint State as possible. When issued, the silver coins sales will offer information on current sales of the coins as well as any melt values associated with them. Struck with designs similar to the White Mountain Quarter, the obverse of this silver bullion coin contains a portrait George Washington, the first President of the United States. In fact, this same portrait graces all of the America the Beautiful Quarters as well as the other related America the Beautiful coins and was originally designed by John Flanagan for the 1932 circulating quarter. "The reverse design depicts Mt. Chocorua, the easternmost peak of the Sandwich Range, framed by birch trees. It is an iconic view of the White Mountain National Forest system lands. Inscriptions are WHITE MOUNTAIN, NEW HAMPSHIRE, 2013, and E PLURIBUS UNUM. The reverse was designed and executed by United States Mint Sculptor-Engraver Phebe Hemphill."